We read this article ‘Understanding Dyslexia‘ from Kids Health and were surprised about the facts and misconceptions about dyslexia. Dyslexia has nothing to do with being smart! There are so many brilliant and creative famous people (like Ally) that are plagued by dyslexia. We also watched a Ted Talks video to gain more knowledge. 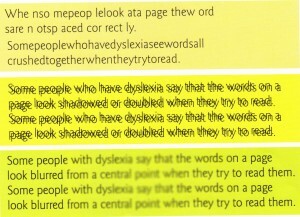 Then we reflected on how it difficult it would be to read (the yellow picture) for someone with dyslexia. Activity: Based on the article “Understanding Dyslexia” as well as the video and picture above, do you think that dyslexia is misunderstood? Use evidence to support your response. Let’s include our voices this week in our responses. You can use one of the following apps or introduce the participants to one of your favourites. 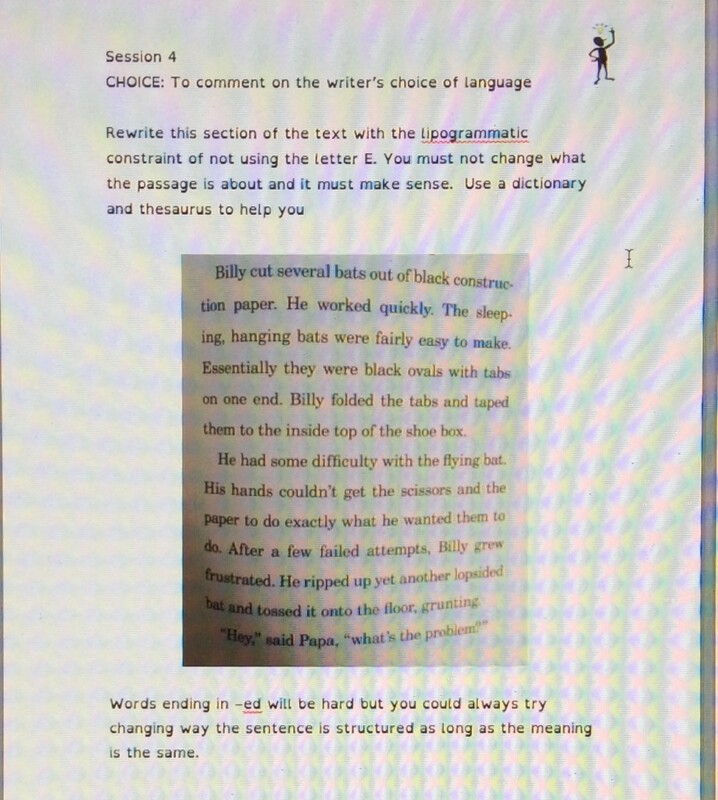 I was first introduced to Lipograms when I was fortunate enough to travel to Manchester for a conference on ‘Developing writing in the Modern Classroom’ led by Alan Peat and Lee Parkinson. Over the last 18 months these two have had a significant impact on the teaching of a range of subjects through their innovative use of a combinationof high and low tech strategies to engage learners. Lee Parkinson’s blog is inspirational for anyone wanting to use iPads and digital technology to raise standards. I have used many of his ideas over the last two school years to great effect and would highly recommend reading his blog. Alan Peat is a former teacher, now a writer and speaker who has written a number of books and successful apps to develop the use of literacy skills. I first came across him through Twitter and was introduced to his ‘Exciting Sentences’ which I introduced to my school and have been embedded in our practice for over a year. You can find out more about them from his website. When I went to the conference I was introduced to the idea of Lipograms, something I’ll admit I had never heard of. A lipogram is a constraint that is used when writing and can often be developed as a task for deepening the challenge for higher attainers. The concept is very simple: a piece of writing is produced in which a particular letter is omitted. The example we worked on during the course (and I tried out with my class on return to school) was of Humpty Dumpty, rewritten without the use of the letter a.
Couldn’t return Humpty to his previous condition. When I asked Alan for a suggestion of activity for the GRA, he suggested that we try writing lipograms for a section of the text, and to enhance this further, to read the version we have written alongside the printed original in order to see where changes have been made. It has also been suggested that we video or audio record these reading and share them so that children can hear different accents/voices from around the world. 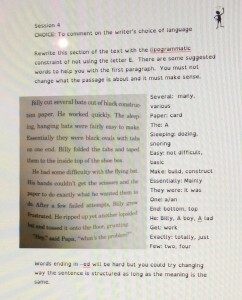 This could be done using Write About This. Here’s an example from Billy Miller that I will use with my class (differentiated to accommodate the ability of my students). 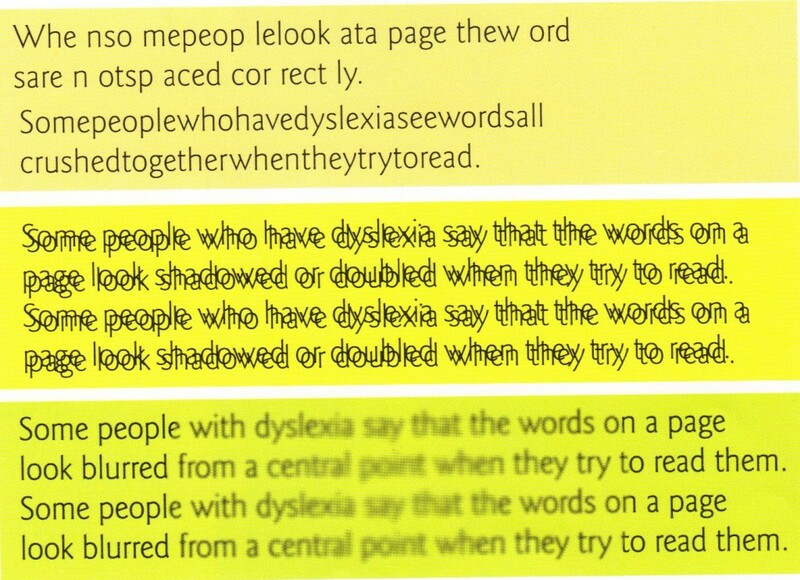 We watched ” Dyslexia: The world the way I see it (award winning documentary)”, by Elliot de Neve, on YouTube. 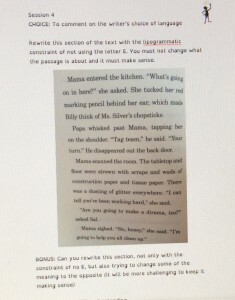 It allowed the students to understand what dyslexia feels like, firsthand.